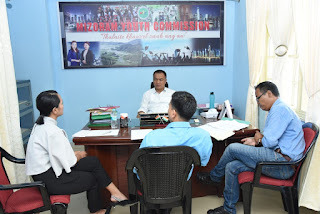 Vawiin khan Pu Joseph Lalhimpuia, Chairman, Mizoram Youth Commission kaihhruaina in Cash Incentive Award Committee- te chu MYC Chairman office ah an thukhawm. Award hi sem leh ngei nise tiin Committee chuan a rel a, Incentive Cash Award Committee hi constitute thar niin, heng mi te hian uluk takin he award scheme hi zirho in, category 4 - ah then a ni. CATEGORY - 1 ah hian All India Services leh Central Services Rules in a huam chin an tel anga, heng a inziak tlingte hi Rs 2,00,000 (Nuai hnih) pek an ni dawn a ni. CATEGORY – II ah hian UPSC in exam a conduct zawng zawng a huam anga, heng mite hian Rs 1, 00,000 (Nuai khat) an dawng ang. CATEGORY – III ah hian UPSC nilo, Group A & B, Semi – Govt. leh International, National reputed a entrance Examination/ Scholarship a tlingte an awm anga, heng a inziak tlingte hian Rs 50,000/- (Singnga) an dawng ang. CATEGORY – IV ah hian Academics lama mi chungchuangte dah an ni leh anga, heng mite hian Rs 40,000 an dawng bawk ang. Cash Incentive Award hi 26th June, 2018 khan Hon’ble Chief Minister ho a sem a lo ni tawh a, tun a revised scheme hian 1st April, 2018 – 31st March, 2019 thleng a huam ang. Any other Group ‘A’ post (Direct Entry) under the Government of India conducted by other Competent Authority like ICAR, DRDO, ISRO, RBI, IBPS, etc.